Today was a day of two tales: my mom’s funeral and Jackson’s trip back to the hospital. Jackson was enjoying being home since we were released from Sloan last Saturday. However, this round has hit him really hard. Most of the week he has been slow, hasn’t had much of an appetite, and wants to hang out on the couch and watch his iPad. However, he wasn’t running a fever which means he gets to stay home. Unfortunately, on Saturday afternoon his fever returned and Meredith and Jackson returned to Yale for yet another stay. Jackson will have to stay until his fever is gone for 48 hours and his white blood cell count recovers. Our house is starting to feel like a vacation spot. While Jackson and Meredith were taking temperatures and heading back to Yale, I was attending my mother’s funeral. The pastor did a nice job on the sermon (despite pronouncing our last name as “Colden”). My father, sister, and I spoke and then two of my mother’s students parents and our neighbor Anne Nix also spoke. It was a nice send off for my mom, she would have been happy. I really appreciate everyone showing up for the funeral and viewing. Your support during these difficult times truly means a lot. Jackson, when you get older and read this, here’s a copy of the eulogy I wrote for my mom. She was an amazing woman and I’m sad that you won’t get a chance to meet her when you are older. However, you have one great guardian angel looking out for you! Thank you all for coming, it means a lot to us all. My mom was not a fan of traditional funerals. She didn’t like the black clothes and somber faces but instead thought it was better to celebrate life. In fact, she instructed me at one point to wear red to her funeral. I thought a red dress may be a bit much and the image of my brother in a red suit was a little frightening but we all managed to find a bit of red to wear today to celebrate. So I encourage everyone to go ahead and remember and celebrate the years we got to spend with her as I am sure she is with us today for the celebration. 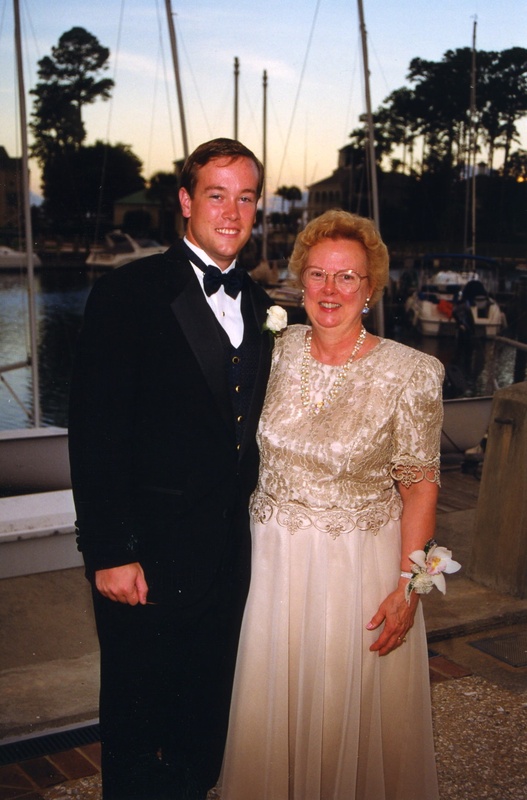 My mom enjoyed life and loved to travel, teach, shop, and spend time with the family. Traveling and seeing new places was a big part of my mom’s life. Many summers, our family would load up our van with suitcases and boxes of clothes, books, and food and head out for a three week trip across the US and Canada. It was always quite the adventure with my dad at the wheel and my mom co-piloting armed with our AAA trip tickets and guide books but never any reservations. Our family covered most of the US states and Canadian provinces on those trips. It was fun to see many national parks along with nearly every waterslide, alpine slide, go-cart track, and fun hotel pool along the way. After my brother and I left the house, my parents continued their trips. They started traveling internationally and visited six European countries. Her passion for travel lives on and will be passed on for generations. Teaching and helping children was another of my Mom’s passions in life. She spent over 10 years in the Maryland public school system as a teacher and reading resource specialist before setting up her own private practice in 1972. My mother never took the easy way as a tutor. She spent countless hours rewriting lesson plans, tailoring them to the students to make sure they got the most out of it. Through her work my mom truly made a positive and lasting impact on her students. In addition to traveling and teaching, my mom loved to shop as anyone who saw our closets, basement, or pantry (i.e. the bomb shelter) would know. She loved a good bargain and taught us to be resourceful to find them. It was not uncommon in our house to drive 30 minutes or more to find what we are looking for at some mall or store. My mom wasn’t able to get out of the house on her shopping trips as much over the last few years but she still found enjoyment in the piles and piles of catalogs that would come to the house. Luckily for my dad, my mom never learned to use a computer. If she had discovered the internet and the endless shops online, my dad would have had to buy her a bigger house to store all of her bargains and purchases. While my mom was passionate about her traveling, teaching, and shopping, I believe her family was the essence and substance of her life. Anyone who knew her soon learned her heart was centered on her husband, children, and grandchild. My mother met my father Neale 53 years ago and they got married a few years later. Over the past 48 years my mom has been an incredible part of my father’s life, not only as a loving and devoted wife, but also as his best friend. Together they raised two children and saw a large part of the world. I know my Dad will miss her deeply, but I know he will find solace in the countless good memories that they created and shared over the years. As a mother, my mom did an amazing job raising two kids who she was very proud of. We were always well cared for, well loved, and well fed. We were told we could do anything we wanted with our lives and there were no bounds to our dreams and goals. My mom had an amazing generous spirit. Growing up, my mother had an incredible way of making holidays or birthdays truly special events. She had a true passion and talent for planning our creative parties with games, cakes, and decorations that were memorable and far from ordinary. She really enjoyed having family and friends around to share time with us whether it was at our house or on trips. Over the past few days, I have received several emails and messages from many of my childhood friends (some I hadn’t spoken to in 20 years) expressing their condolences but remembering my mom for her kindness and generosity and celebrating the fun times we all shared together over the years. My mother’s generosity, creativity, and passion for enjoying time with others lives strongly in her children. My mom was a truly proud grandmother. Her first grandchild was my son, Jackson. She was so proud of our little guy and his kind heart and energetic spirit. His picture was the first and only picture allowed to hang on the refrigerator in her kitchen. A true honor for those who knew my mom, as nothing was allowed to hang on refrigerator after she had the kitchen redone almost 20 years ago. My mom always enjoyed hearing stories about Jackson’s childhood antics. After hearing several stories of his wild man stunts such as diving in the pool or ocean without hesitation, she gave him the nickname “Fearless.” Little did we all know at the time just how fitting that nickname would be. I have watched my son fight his battle with Stage 4 cancer over the past few months with a grace, strength, courage, and determination that is a true reflection of my mom’s spirit and the nickname she gave him. I know my mom is in a better place, proudly smiling and looking down over Jackson and putting in a few good words with the big man for him. I know she will be a strong and proud guardian angel for Jackson and his brother throughout their lives. My mom was an amazing woman. Her kind heart and generous spirit will truly be missed. The dignity and grace by which she sailed through life has left a wake of beauty across the many hearts she touched. She will truly be an eternal influence on us all. I know my mom is in a wonderful place, free from the suffering that has plagued her recently. I truly believe she is smiling down on us all and enjoying this celebration of her life. My mother would not miss a party. Mom, may you rest in peace yet enjoy every minute of the wonders of eternal life, we love you, miss you, and look forward to seeing you and celebrating with you again. I love you Mom. You will be missed but never forgotten.